We're great at what we do. We're here if you need us. Founded by the defense attorney St. Charles has trusted since 1999, Byrnes Law Firm is a team of lawyers serving the St. Charles and St. Louis areas. When a client comes to us, we know they are likely going through one of the most trying times of their life. We know that clients not only need legal representation, but a compassionate, attentive personal who will listen. Bill Byrnes has earned a rating of “excellent” by the independent legal review organization Avvo. The Byrnes Law Firm office is located in St. Charles, but we can also represent clients charged in St. Louis, Clayton, Ferguson, or any of the surrounding areas. Bill will give you his personal attention and once you are his client you will have his personal cell phone number so you can call him at any time. Bill is transparent and available. It is why he is so trusted by his clients. You will feel like family because he will have your back. Your choice in an attorney in St. Charles or St. Louis, as well as the surrounding areas in Missouri should be one you choose carefully, and your lawyer has to be thoughtful and determined for you. We’re a St. Charles law firm that strives to rise past client expectations. We’re strategic, not reactionary. We have a passion for defending the rights of our clients. With Bill Byrnes as your attorney, you will be given the personalized attention your case deserves. You will be treated with respect. And, Bill will fight to make certain your case reaches an optimal outcome. Byrnes Law Firm practices in many areas of criminal law, including DWI arrests, drug possession, weapons, theft, forgery, and other criminal charges. We also practice in the areas of family law (divorce, custody, support) and personal injury. Most importantly, when we take on a case, we have two primary goals in mind: to fight for our clients’ interests and to win. CALL OUR OFFICE at 636-896-4300 to set up a FREE CONSULTATION. Our phones are available 24 hours a day. Why Call Byrnes Law Firm? Bill is more than just some lawyer. He truly cares, and treats each of his clients with a far more personal touch than most other lawyers. How far will bill go for his clients? Take a look at this. You can meet our law team to discuss your case in St. Louis or St. Charles. Most clients prefer to call Bill directly on his cell phone. However we, have a beautiful office just over the bridge in St. Charles County off 5th Street. Office visits are not an additional charge. 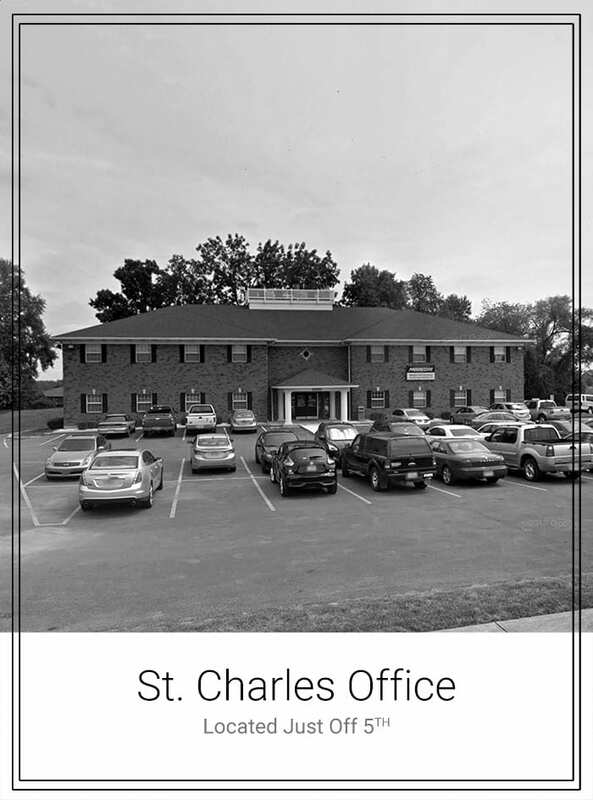 Our St. Charles Office is on the first floor and offers free on site parking. You can complete your case over the phone. Your choice. Many clients choose to meet at our office when preparing their criminal defense strategy. Office visits are free. We can review your police reports and DWI paperwork together. Call or office at 636-896-4300 to see us in the location you prefer. This list in not exhaustive. A DWI charge can lead to losing your driver’s license, jail time, and large fines. It’s important that you speak to an attorney so that you can be prepared and have a great defense on your side. Bill can help you. Bad things don’t usually happen during office hours. If you have a legal emergency, that we can help with please don’t hesitate to get our advice. Helpline is 636-896-4300 call or text us. We offer weekly and monthly payments. You can bring payments in our we can schedule them automatically. Payments must be complete before the case closes. We have credited several guides for you or your kids. First time getting pulled over. Arrest Guide. DWI Checkpoints. My Parent’s Divorce. Divorce Guide. See downloads here. We offer clients the ability to view their invoices, payments and balances. The transparency you want. Plus, get text alerts on events, court dates and deadlines. Client Portal. With more than eighteen years of experience, Bill knows his way around the courtroom. He understands the tricks used by the police to convict people, and he knows how to defend against them. Having won thousands of cases, it’s clear that Bill will fight for you to get the best possible outcome. He starts by going after a dismissal. If you’re in need of legal assistance in the St. Louis area, contact our criminal defense attorney Bill Byrnes . To learn more about Bill and a his core beliefs that guide him, read more about Criminal Defense Attorney, Bill Byrnes here. See Cases Won, Awards Received, Practice Areas, F&Q and Articles.